One of the features of this plugin is that it offers many css selectors so you can add your own unique styling to events, properties of events, or groups of events. 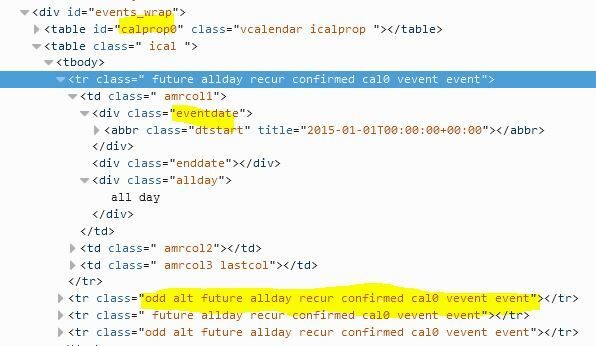 Category – A css class has been added to the event row for each ical categories – see version 2.9.2. However not all ical generators allow one to specify the category field (eg: google does not). A plugin that I am working on to add events in wp, will allow one to allocate categories and tags to an event. optional – only if specified in the settings? possibly only the first alpha numeric string with spaces (and other punctuation chars) removed before a comma? Each property (eg; summary, start date, location etc) is assigned a corresponding class, so that one can style these uniquely – see the showcase for some examples. See the settings page or the ical spec for the list of properties.